The bow is a musical device that is pulled across the strings of violins, violas and cellos to make them produce sound. 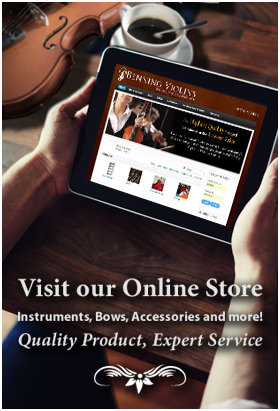 Bows come in different lengths for each respective stringed instrument, and different types and quality of materials. Cello bows tend to be shorter in length than viola bows. Violin bows typically measure the longest. A bow can enhance or deter the sound of the instrument, and it is recommended that the player test out different bows to see which fits best. Typically, the higher pitched a stringed instrument is, the longer the bow needs to be, though this is not always the rule. The hair of the bow, with the addition of rosin, catches the string for a certain distance through friction, then releases the string, causing the tension to release and vibrate. Typically, higher strings need to be bowed faster and at a longer length of the bow in order to resonate as loudly. Likewise, a lower pitched instrument, like a cello or double bass, requires more pressure, and a shorter bow focuses the pressure on the string. 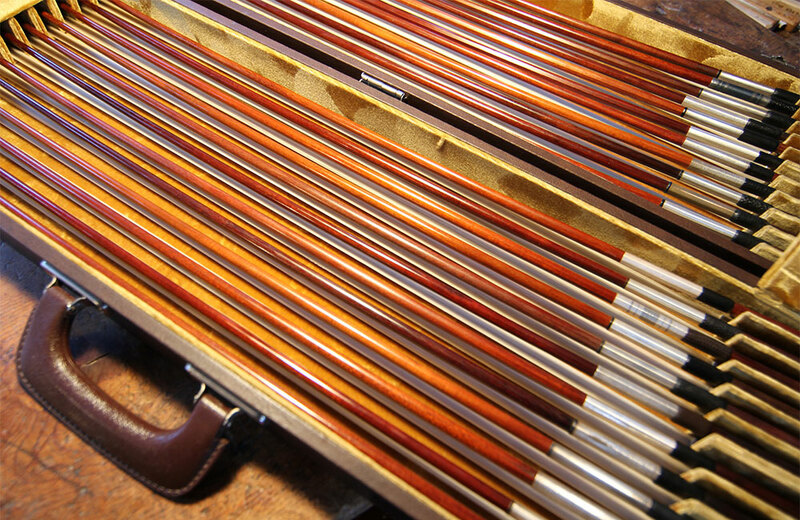 The material of the bow stick mostly measures the quality of a bow and its impact on an instrument’s sound. Pernambuco is considered the highest quality stick because it is of a rare durability and elasticity. Carbon fiber bows are heavy duty and bonded with resin. They are considered environmentally friendly, as the pernambuco tree is increasingly rare. Fiberglass and tropical hardwood bows (such as Brazil wood) are much cheaper in quality and considered better for a beginning student. A good bow is a good weight and balanced, and will feel like a natural extension of the body while playing. The weight of the bow should feel evenly distributed. A more flexible bow can deliver a smoother, fuller sound, while a stiffer bow can create a bright, directed sound.